As part of Boston Design Week our work at Central Square in East Boston is being featured in the #ThisIsLandscapeArchitecture exhibit in Boston City Hall’s lobby. East Boston’s Central Square was one of three pilot projects for the Boston Water and Sewer Commission to deploy and test multiple green infrastructure strategies to reduce stormwater runoff and phosphorus discharge into Boston Harbor. In addition to Central Square, the exhibit showcases a number of other open space projects, built or in progress, that support the vision for Mayor Walsh's Resilient Harbor Vision plan. The exhibit is up through April 7th. In conjunction with this exhibit, the BSLA and City of Boston are hosting a youth panel with high school students on April 4th, 5:30-6:30pm at Boston City Hall to discuss resilience, design, and the future of the City. You can learn more here. Earlier this week Mayor Walsh gave his annual State of the City address. In the speech we were very pleased to hear him mention the redesign of Central Square in East Boston as an example of the City’s commitment to improve dialogue between City and communities to provide better solutions for both. “We are opening doors to new schools, new libraries, new homes, and new jobs. And we're listening to new voices. It's not always easy or comfortable. But a more open conversation means better solutions for our City. It's the sign of a more vibrant democracy. And it's working. We’re excited to announce that two of our projects have received Architecture Masterprize Awards. The global design competition selected Fisher Hill Reservoir Park and Roemer Plaza for awards. Fisher Hill Reservoir Park, our 10-acre project in Brookline, Massachusetts, reclaimed an abandoned reservoir while preserving the historic gatehouse and reservoir landforms won for the public landscape category. Roemer Plaza which is part of Suffolk University’s campus in downtown Boston won for educational landscapes. Next week at the ASLA Annual Meeting and Expo in Philadelphia Mark will be part of an interdisciplinary panel looking at how interior/exterior landscapes and other strategies for engaging nature, achieve qualitative goals in better patient, family and staff expe­riences, and quantitatively improve patient outcomes. Joining Mark on the panel are: Rosalyn Cama (CAMA), Virginia Gehshan (Cloud Gehshan Design), and Ellen Taylor (The Center for Health Design). 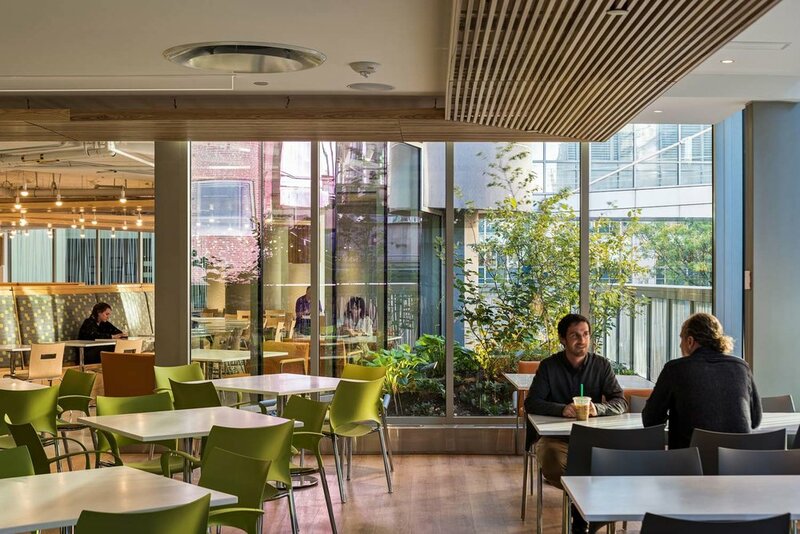 KMDG, CAMA and Cloud Gehshan Design were part of a landscape-led, interdisciplinary team to overhaul Brigham and Women’s Hospital campus in Boston’s Longwood Medical Area. Last Friday the City of Boston held a kickoff ceremony for the tactical plaza recently completed on Franklin Street near Downtown Crossing and Millennium Tower. The temporary plaza being called "the Tontine Crescent" was designed by Ground Inc. Part of the Downtown Boston Business Improvement District (DBBID), we are excited to see this project gain traction after being identified as an opportunity to enhance Boston’s downtown public realm for pedestrians in the 2014 Design Guidelines KMDG created in collaboration with Gamble Associates, omloop, and HR&A for the Business Improvement District and the Boston Redevelopment Agency. 2014 Downtown Boston Business Improvement District Design Guideline's Tontine Crescent tactical plaza recommendation. Check out the latest news on the tactical plaza at the Boston Globe, the Boston Business Journal and Curbed Boston. 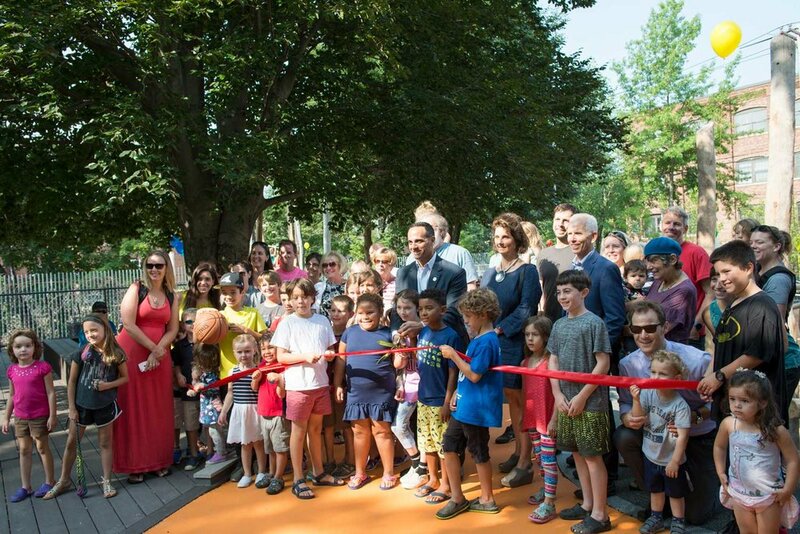 This past Friday Somerville’s Hoyt Sullivan Playground opened to the public. Mayor Joseph A. Curtatone and Arn Franzen, the City's Director of Parks and Open Space, presided over the ribbon cutting. The turnout was fantastic, and we were so happy to see so many neighborhood kids present, all of whom who have been patiently awaiting the opening! The park redesign emphasizes adventure play for all ages. A dynamic and interactive water feature is nestled inside a sand play area where kids can engage with different textures and pliable materials. There are two wood climbing structures and a tower with slides. A cycle track or ‘The Speedway’, as some kids are calling it, winds through the entire playground. Utilizing the site topography, the track climbs to the highest point of the playground via a switchback then allows kids to race down the back side in a straight-away. One of the many community requests was for an area to more easily view trains. Neighborhood kids refer to Hoyt Sullivan as "train-go-by park" so we emphasized the connection by creating a new viewing platform which extends over the steep slope of the track embankment and allows kids to watch commuter trains (and eventually the green line trolleys, when the new extension is completed) pass by the park. When the first train passed the morning of the opening, kids came running to the platform from every corner of the park. It was the reaction we were hoping for! In addition to the play features, the playground and park provide improved spaces for the community to gather and enjoy the outdoors. A community table and other seating are part of the redesign. Improved lighting allows the site to be utilized after the sun sets and preserving the tree canopy provides ample shade for visitors throughout the day. An existing beach tree continues to be the centerpiece of the park, but now families can sit on the deck surround enjoying the tree in a more intimate way. 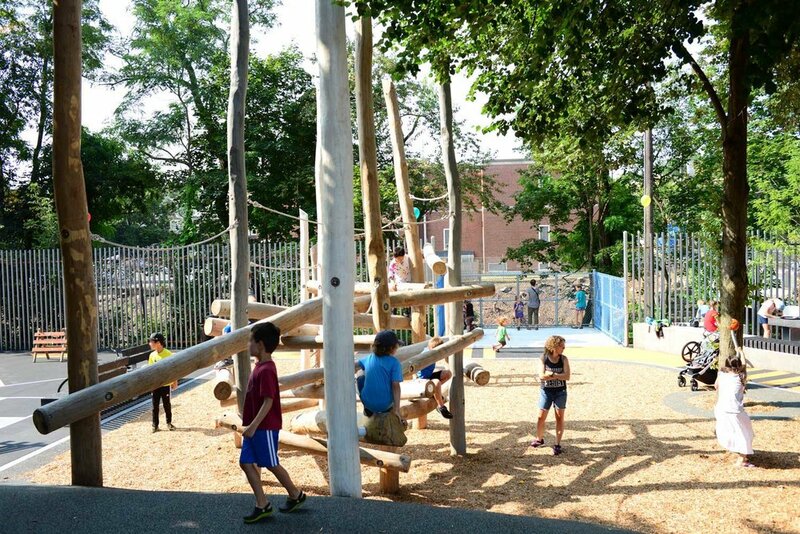 With focusing on natural materials, adventure play and bolstering community gathering opportunities, while preserving much of the original tree canopy, Hoyt Sullivan is the product of a visionary and collaborative process which creates a new paradigm of community parks for Somerville. Planting is wrapping up in Kendall Square at the Longfellow Gateway project and the striking mixture of Carex pensylvanica, Carex glauca 'Blue Zinger', Carex muskingumensis and Leymus arenarius 'Blue Dune' create a strong visual experience for pedestrians, cyclists and vehicles moving in and out of Cambridge on the newly restored Longfellow Bridge. We are counting down the days until the newly designed Hoyt-Sullivan playground opens in Somerville. The site is composed of three main play areas for different age groups. A path connecting the areas weaves visitors under the established tree canopy of beech, linden, maple and oak. We are excited to see the design ideas come to fruition and we can’t wait for the neighborhood children - who have been enthusiastically waiting - to make it their own! Kendall Square's latest landscape is taking shape as the plant installation process begins for the Longfellow Gateway. The East Boston Farmers Market has returned to Central Square drawing local vendors and the community back to the square. After a significant design, public and construction process it is exciting to see this space activated by the community. 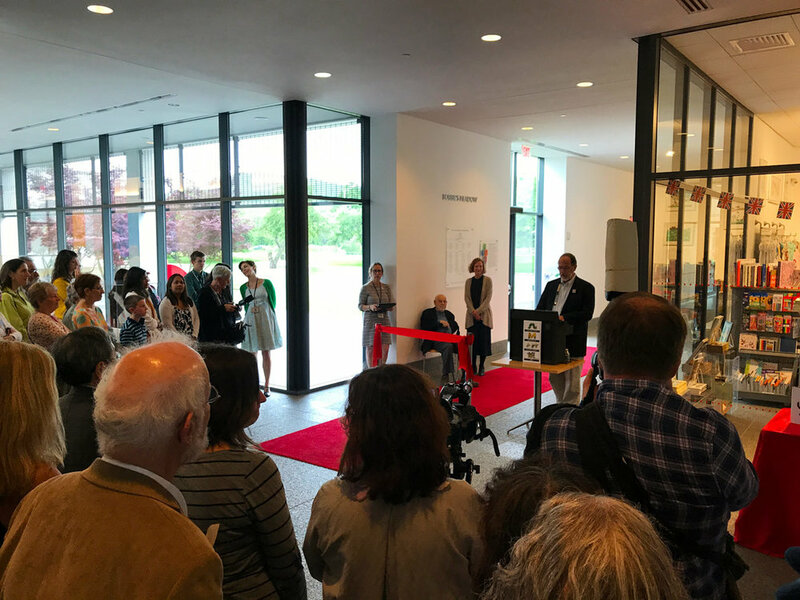 Bobbie's Meadow at the Eric Carle Museum for Picture Book Art has officially opened with a Ribbon Cutting ceremony over the weekend. Sitting in the hundred-year-old apple orchard at the Carle and with the Mount Holyoke Range as the backdrop, Bobbie's Meadow was designed as an outdoor resource for the entire community. A place where flora and fauna come together featuring wheelchair-accessible walking path and concrete seat walls surrounded by a native wildflower meadow. Read The Carle Museum's press release about Bobbie's Meadow here. We recently visited our project at Summer Star Wildlife Sanctuary in Boylston, Massachusetts. It was great seeing the predominately native landscape continue to flourish, further tying the site to its surroundings. On Tuesday, June 12, Kaki will be joining a team of industry thought leaders including Barbara Deutsch (CEO of the Landscape Architecture Foundation), Beka Sturges (Reed Hilderbrand), Kimberly Driggins (City of Detroit), Shauna Gillies-Smith (Ground), Gina Ford (Agency) and Diana Fernandez (Sasaki) to discuss equity and inclusion in the built environment and also LAF's New Landscape Declaration. You can learn more and register for this free event here. KMDG + BSLA Help Rethink Chelsea Square! KMDG joined the BSLA and a team of interdisciplinary designers for a one-day charette to help the City of Chelsea envision opportunities for short and long-term improvements to Chelsea Square. The focus was on how to better activate this important public space to serve the Chelsea of today and tomorrow while looking to incorporate public art, and building upon the culture and history of site. The results of the day-long charette were then shared with the public at Mystic Brewery. Architecture Boston's Spring 2018 issue PORT is out now. In the issue Kaki (AB editorial board member) reviews Peabody Essex Museum's exhibition on Georgia O'Keeffe: Art, Image, Style. As part of Cambridge's ongoing Urban Gardening Series, Kaki and Zachary Navarro of Essex Horticulture gave a presentation on our work at Fresh Pond Reservation which will be finishing up later this year. The design features the use of hummocks as a strategy to help minimize the impact of storm events, extensive bio retention basins, moving the perimeter road away from the reservoir and relocating the community gardens so they are more accessible. Stay tuned for more updates as we will be announcing once the project is officially opened to the public.